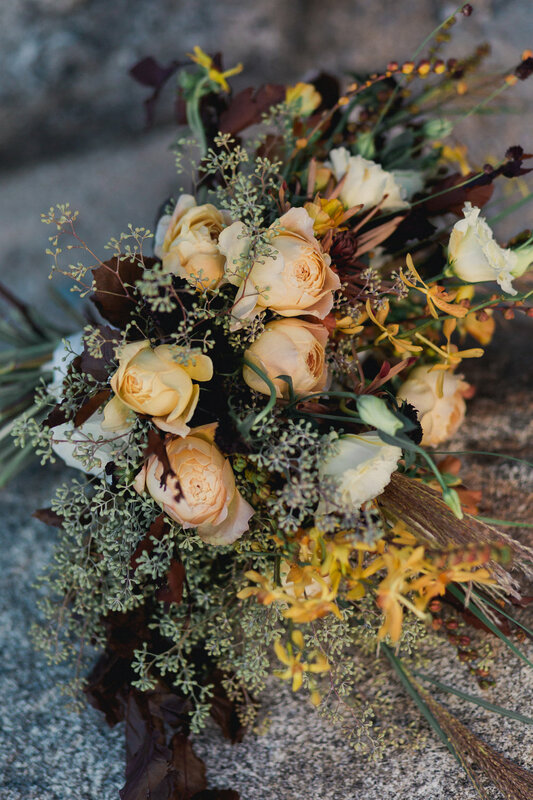 We had the pleasure of providing the flowers for Tara + James’ wedding on September 29th at The Stone Barn. The Stone Barn is a part of St. Joseph’s College and is situated at Sebago Lake in Standish, Maine. She of the Woods & Malorrie Ann Photography photographed the day. 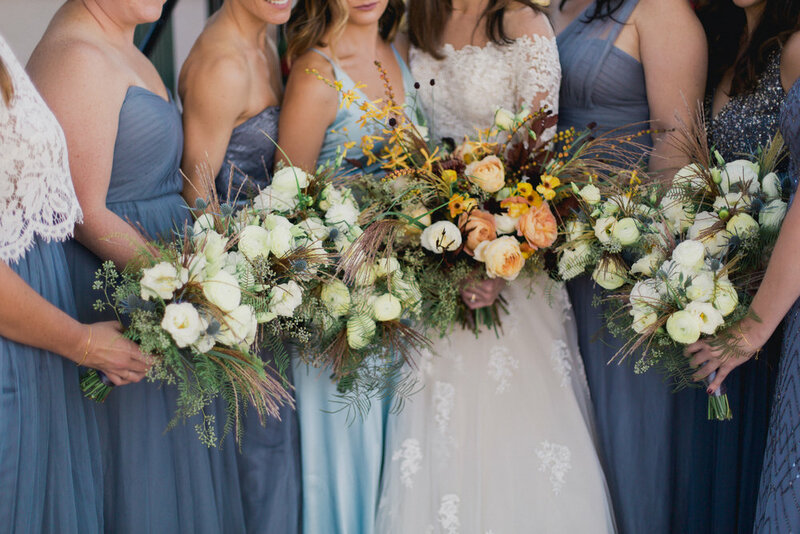 Tara’s bouquet was wild and textural with rich, varying tones of yellow, tan, taupe and chocolate. 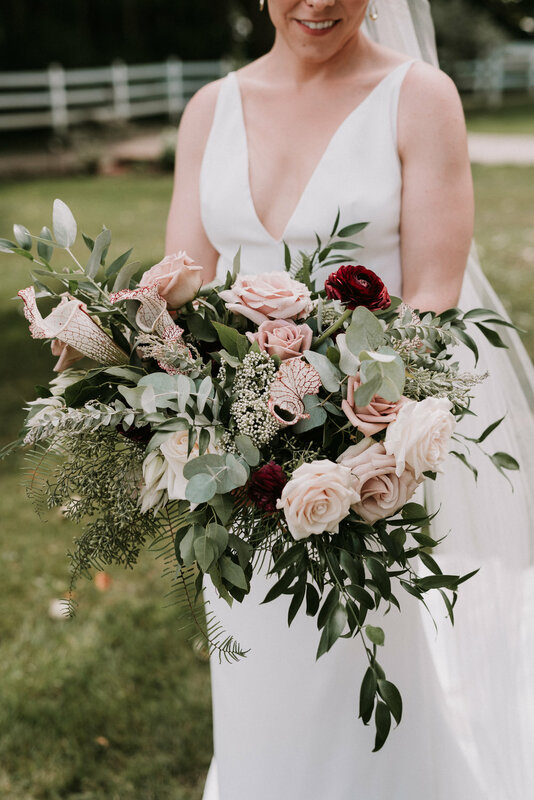 We incorporated Crocosmia pods, Miscanthus grass, Seeded Eucalyptus and Copper Beech leaves to give Tara’s bouquet volume and interest. Karina is an identical twin. I didn’t know this until I arrived on site at Live Well Farm and handed the bridal bouquet to the her, only to see (who I thought was) her again a few hours later holding a Bridesmaid bouquet and wearing a white gown. Their resemblance was incredible! Karina, Seth and her identical twin sister on the right. Karina + Seth met in College at Northeastern and moved to Cambridge. Karina grew up in Spruce Head, Maine and still returns to visit friends and family. Choosing Maine as a destination for their wedding seemed to be a no brainer. Live Well Farm is located in Harpswell, Maine- just a short drive from the town of Brunswick, where Bowdoin College is. Karina opted for subdued colors; muted shades of mauve, taupe and sand. We used ‘Amnesia’, ‘Quicksand’ and ‘Sahara’ Roses with accents of wine colored Ranunculus and Sarracenia orchids. We loved that the Bridesmaids and Bride all wore shades of white. 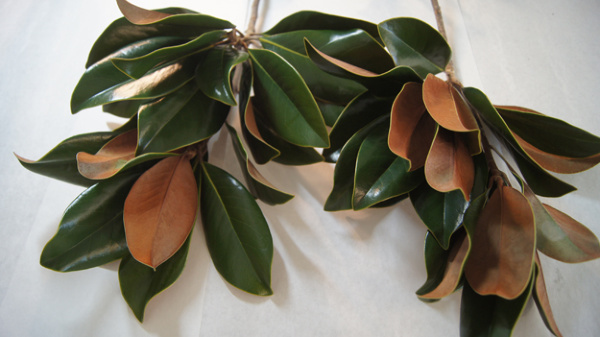 Seth is wearing a ‘Amnesia’ Rose Boutonniere with a backing of Eucalyptus greenery. Tori + Steve were referred to us by Emily Hricko of Emily Elizabeth Events, who also happens to be Tori’s older sister. 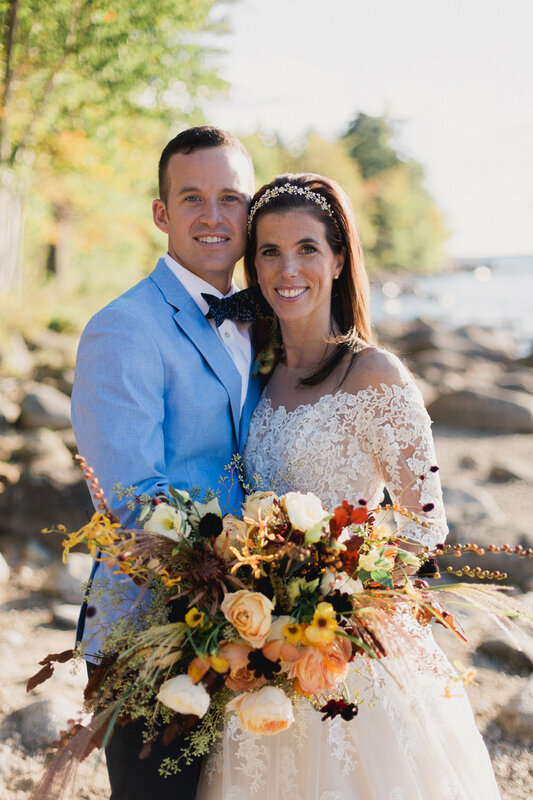 Tori + Steve chose The Breakwater Inn in Kennebunkport, Maine for their ceremony and reception location. 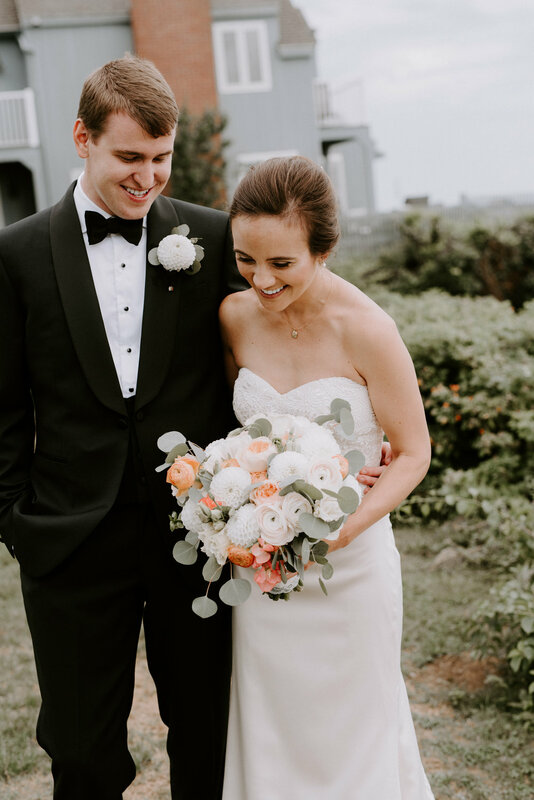 They lived in Boston and were looking for a destination venue convenient for their guests to travel to with the space to accommodate them all. Nothing beats an ocean backdrop and the sophistication of black tuxedos. 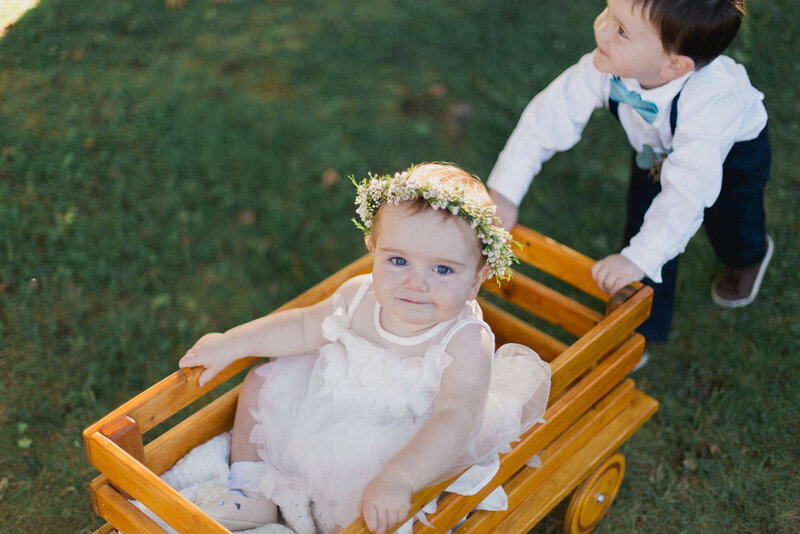 Lindsay Hackney Photography of Derry, New Hampshire photographed their wedding. Sperry Tents Seacoast provided the beautiful white sailcloth tent, the walnut cross back chairs and the tables linens. Their 3-tiered cake was provided by Let Them Eat Cake, out of Kennebunk, Maine. We added flowers to the top and alternating tiers. Pictured here are ‘Juliet’ Garden Roses, (watch the video link to learn all about this amazing flower), orange Ranunculus and cream Lisianthus. Krista + Victor married on Friday, July 6, 2018 at a private, oceanfront home in Freeport, Maine. Heidi Brisette, owner of SHE Luxe Weddings was the mastermind behind this wedding. The design was all about romantic white flowers and dripping, vining, greenery. The clear top tent had hanging structures with draping greenery and Hanging Amaranthus. No detail was overlooked. Walnut cross-back chairs…luxurious linens and taupe colored candle tapers. Taupe tapers with gold accents. Krista and her wedding party embodied casual sophistication. We paired crisp white flowers against rich greenery for contrast. Jaimee Morse Photography captured this day and night perfectly. Aurora Provisions catered the event. A customer called us the other day to order flowers. While I took her order, she recalled how she used to buy Delphinium from Amy for $1/ stem many years ago. This was the first I'd heard of it. Amy grew up in California where she experienced the magic of flowers in bloom year round but it wasn't until after she had gone to college (where she studied Art Education), then worked as a boat broker, got married and settled down before she revisited her love of flowers and plants. She got her start when she bought 700 Hybrid Delphinium plants from Ball Seed (their minimum at the time) and planted them in a 800 square foot garden beside her garage. 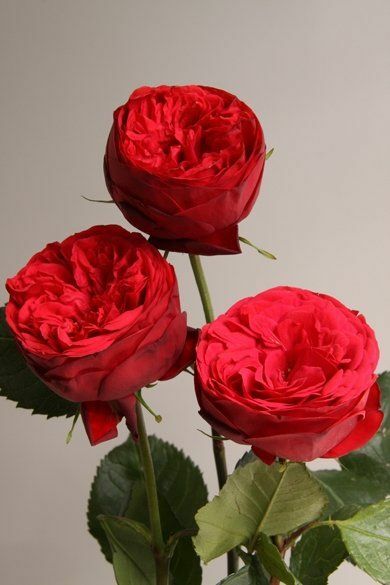 She grew the cut flowers and sold them to neighbors and Skillin's Greenhouses. It was from then that Amy got attention for her gardening and floral design talents. Not long after, she booked her first wedding and garden design client and the rest is history. This styled shoot was a collaboration between Amy, her eldest daughter, Jacqueline Maloney of Asheville, NC, local sculptor, Susan Perrine and Jennifer Battis Photography. Together these women wove a story of how Maine's waters and deep woods lend themselves to the joy of art and romance with a bit of whimsy thrown in. Homage was paid to the natural world through the hand dyed and sewn cloth and fibers used by costumer, Vanya on Jackie's gown to the bold, twisted and intertwined branches and twigs of Susan Perrine's sculptures and through the lens of Jennifer Battis' camera.